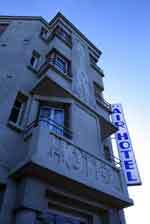 Located front of the exhibition centre of Le Bourget, the Le Bourget airport and the museum of space, near the leader firms of Aircraft, Air Hotel offers 35 rooms single, double, triple and quadruple, and opens its private car park during their stay. From Roissy Charles de Gaulle Airport, take the bus 350 direction "Gare de l'Est" until the station "Musée de l'Air et de l'Espace". From the center of Paris, take the Metro line 4 from "chatelet" to "Gare de l'Est", then take the bus 350 from "Gare de l'Est" to "Michelet Parc des expositions" station.